A for-sale sign has appeared where an apartment complex had been proposed. The riverfront is my beat, as I may have mentioned from time to time, and the other day I could not help but notice that plans for an “upper-scale” apartment complex near Bowman Park seem to have fallen through. The vacant property of nearly 6 acres at 595 Geary St. N.E. is for sale. The former industrial land was last in the news in 2013, when the Salem owners and their architect held a meeting for neighbors to explain what they had in mind. Then, in May 2014, a Salem company cleared the site of brush. 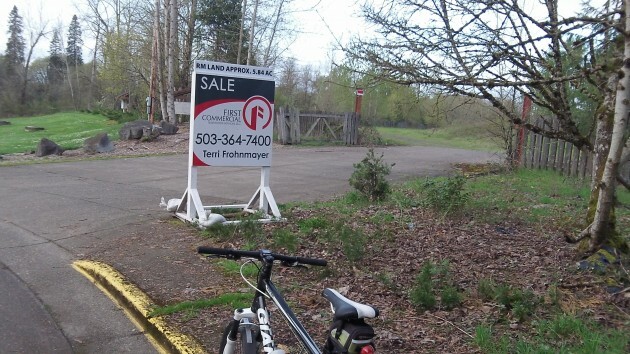 Now, the First Commercial real estate firm of Salem has the land listed for sale, and the asking price is $1.1 million. The property is across Geary Street from Bowman Park. The owners had first talked about developing the site about a dozen years ago, and CARA, Albany’s downtown urban renewal district, expanded its boundaries to include it. But nothing more was heard of the plans until 2013, when the neighborhood meeting was held at an Albany hotel. The site once housed a sand and gravel operation and later a plant making roofing shakes of cement and sawdust. That factory, Permawood, was started over strong neighborhood opposition in the 1980s. Later it was bought by American Cemwood, became known as Permatek and was eventually closed. Later still, new owners conducted an extensive environmental cleanup.